Recently, my husband has gone not only gluten-free, but grain-free, dairy-free, and sugar-free. That’s a lot of ‘free’ in my house. But he has never felt better. The ‘diet’ (for lack of better terms) is called Paleo, referring to our paleolithic ancestors…also known as the Caveman Diet. He eats anything his ancestors would have hunted or gathered, such as meat, vegetables, nuts, and fruit. It is based on the concept that our bodies have not evolved to digest the products that modern man and modern agriculture has developed (corn syrup, wheat, processed food, milk products, etc). A good gluten-free substitute in baking is almond flour! Even if you gluten and wheat lovers will dig this! Using almond flour instead of wheat flour will make your muffins lighter and give your muffins more protein, providing you sustained energy throughout the day. You can make your own almond flour by taking raw almonds and processing them in a food processor for a few minutes until a light and fluffy flour occurs. 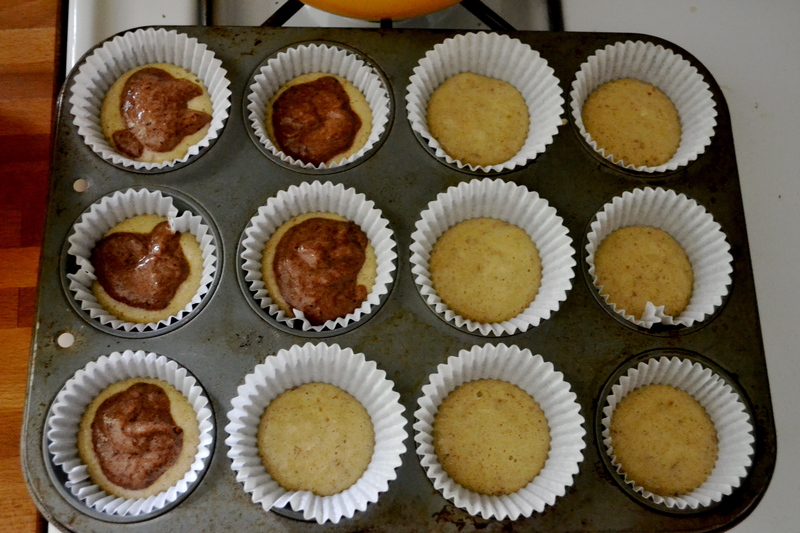 Be careful, if you process for too long, you will get almond butter…which is delicious, but will not help you when baking up these delicious muffins. I bought my almond flour in the bulk section of Whole Foods. I slightly adapted these muffins from a recipe from Honest Fare, using honey instead of processed sugar. They are AWESOME as a dessert, breakfast, or a snack. Love! They are light and fluffy too! I ate one this morning with a tablespoon of almond butter…mmmmmm. 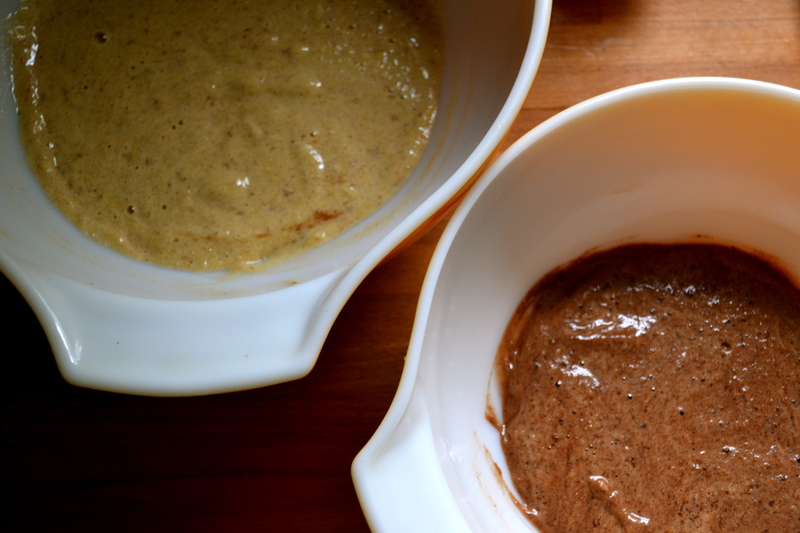 When mixing up the batter, if you want to do the chocolate swirl, divide the batter into two bowls. Mix 2 teaspoons of unsweetened cocoa powder into one of the bowls. Layer the banana muffin mix and then dollop the chocolate muffin mix on top, alternating layers until the muffin mixtures are gone. 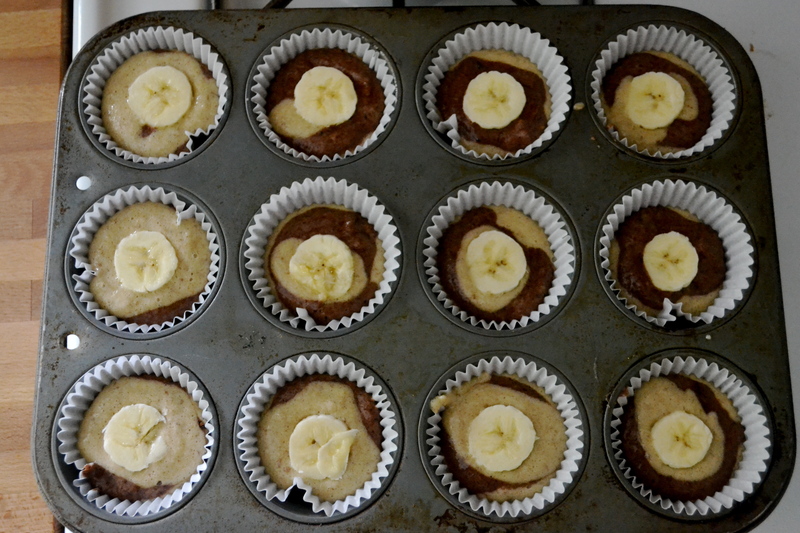 I topped my muffins with sliced bananas that caramelize when baked. Preheat oven to 300 F. Grease 12 muffin tins or place muffin liners. Set aside. Mix almond flour, baking powder, salt and cinnamon in a medium bowl. Set aside. 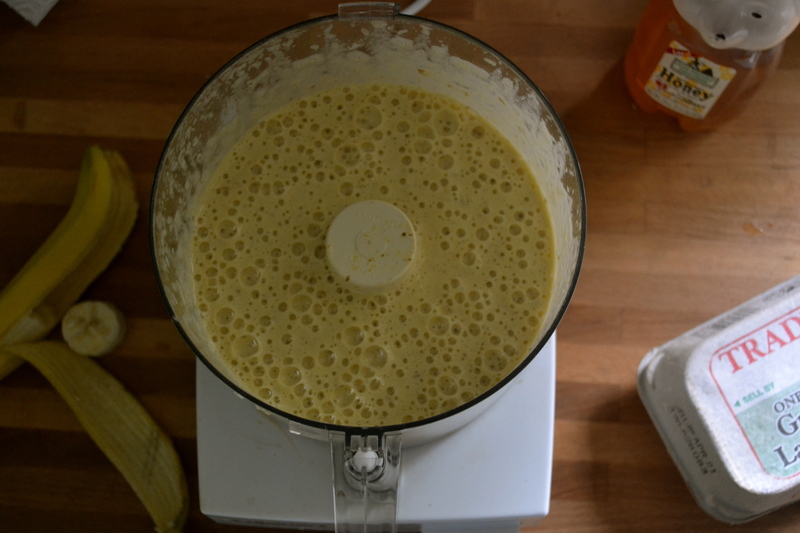 In a food processor or mixer, mix eggs, honey, 2 1/2 bananas, and flax meal on medium-high for 5 minutes, or until mixture is pale and very fluffily. Pour banana batter over almond flour and mix until just combined. Separate 1 cup of batter into a separate bowl. Add cocoa to the separated batter. 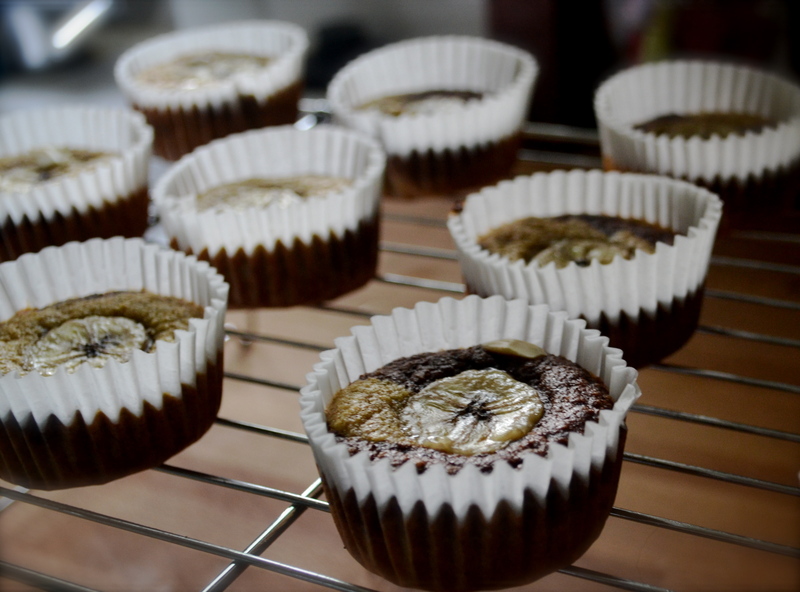 Place a large spoonful of banana batter into muffin liners. 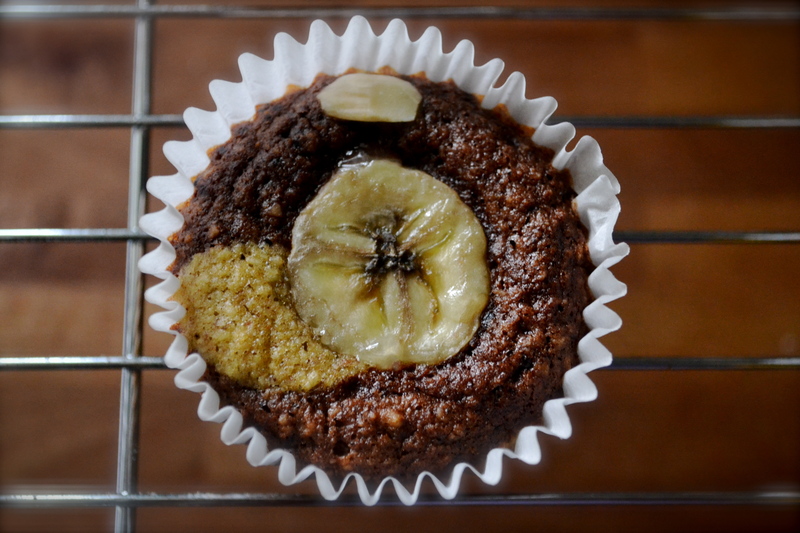 Top with a spoonful of cocoa-banana muffin batter. Pour the remaining original banana batter on top of the cocoa batter. 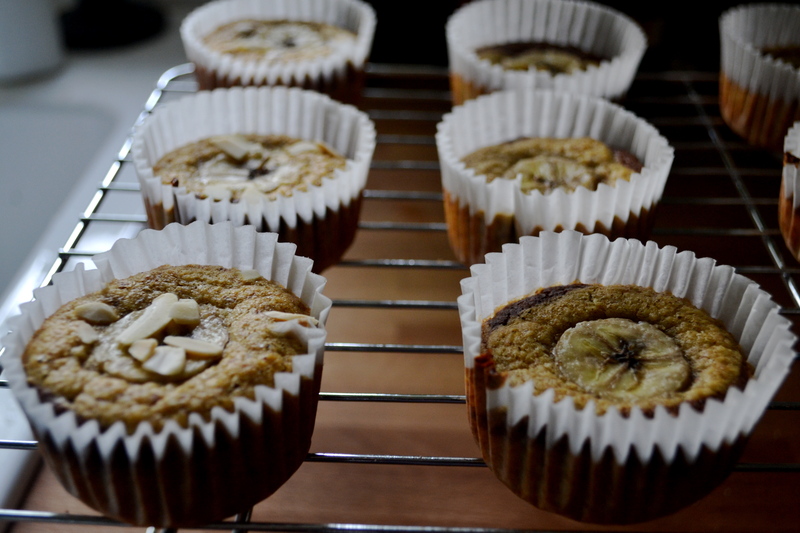 Top the muffins with thinly sliced bananas and slivered almonds, if you want. Bake muffins for 30 to 35 minutes (or until tops are browned and a skewer comes out clean when placed in the center of the muffin). Oh, these look great! I’ve been curious about almond flour, glad to know you like it! I’ll add it to my shopping list. I was pleasantly surprised. I also have some coconut flour burning a spot in my pantry now. Thank you for pointing out my typo! Yikes. My apologies. I have fixed the misprint. Please note that different brands of almond flour may absorb moisture differently and weigh differently. The safest way is to measure out 9 ounces (by weight, not liquid). I don’t have the flax. What is it for? Is there anything else that could be substituted? The flax seed is just for health purposes. Adds omega 3s and fiber. But if you don’t have it, you can leave it out. Alissa, I’m baking mine in a cast iron muffin tin without liners. How do I cool them properly? Take them out of the tin as soon as they leave the oven? Oh wow. I’ve never cooked in one of those before. Did you butter them really well? I think you will need to get them out of the tin pretty quickly. You might let them cool for 5 minutes so they set up then try to pop them out and place them on a cooling rack.